Key performers and performances in Hannah and Hanna by Company of angels. 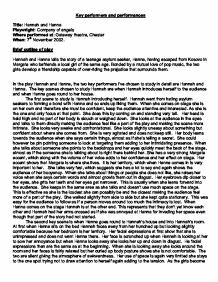 Key performers and performances Title: Hannah and Hanna Playwright: Company of angels Where performed at: Gateway theatre, Chester When: 7th November 2002. Brief outline of play Hannah and Hanna tells the story of a teenage asylum seeker, Hanna, having escaped from Kosovo in Margate who befriends a local girl of the same age. Bonded by a mutual love of pop music, the two girls develop a friendship capable of over-riding the prejudice that surrounds them. 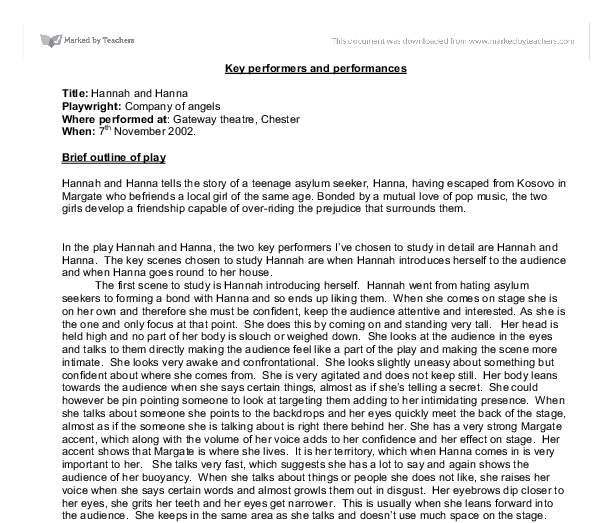 In the play Hannah and Hanna, the two key performers I've chosen to study in detail are Hannah and Hanna. The key scenes chosen to study Hannah are when Hannah introduces herself to the audience and when Hanna goes round to her house. The first scene to study is Hannah introducing herself. Hannah went from hating asylum seekers to forming a bond with Hanna and so ends up liking them. When she comes on stage she is on her own and therefore she must be confident, keep the audience attentive and interested. As she is the one and only focus at that point. She does this by coming on and standing very tall. Her head is held high and no part of her body is slouch or weighed down. She looks at the audience in the eyes and talks to them directly making the audience feel like a part of the play and making the scene more intimate. ...read more. Her facial expressions at first show that she is unimpressed and does not want Hanna there. Her face is scrunched up when Hannah is looking at her to sow her annoyance but when Hanna looks away she looks her up and down in disgust. He facial expressions then are the same as at the beginning. When she is looking away she looks around the room and her faces is fairly relaxed but her curled up body posture shows she is not comfortable. The two are silent giving the atmosphere of awkwardness. Her use of space is again very limited she stays to the one spot trying not to draw attention to herself again adding to the tension. As the girls become more comfortable Hannah starts to uncurl her body and become more comfortable. She no longer avoids eye contact with Hanna and the gap between them closes. Hannah's face also becomes a lot more relaxed (and normal). Eventually the girls get up and start to sing together. When they start Hanna constantly looks at Hannah to see what she is doing because she is not aware of her behavior but then they both become comfortable enough to sing loudly with smiles on the their faces and their heads held high. She also dances freely as well this may be because she is very comfortable or she may be showing off to Hanna to put her in her place. ...read more. still doesn't look at the audience or become any less tense or insecure, she just goes into her own world of memories oblivious to the world around them. The second scene is when Hanna goes round to Hannah's house. Just like Hannah, Hanna's actions are similar. She is very weary of where she is and it is evident that she ha been forced there and not gone of her own accord. Her body is hunched up but she is not as spread out as Hannah is because it is not her room. She feels worse because she knows that Hannah does not want her there. Again her main focus is on the floor and she also occasionally looks around but when she sees Hannah also looking her eye shot retreats to the floor again. When the two start to sing she look very apprehensive always looking to Hanna for reassurance. Her body is very rigid to start with but then she becomes more aware of space, moving around more and keeping eye contact with Hannah. We even catch a glimpse of them smiling at each other. Here we see they are very happy together and they attitudes towards each other change dramatically. Hanna had a good constant accent. Her facial expressions kept realistic throughout. Her voice tones were well used and varied depending on her mood. Her feelings were shown well in her voice, eye contact and body movement. She was a very believable character the audience can relate to. ...read more. Firstly, the film starts with a camera rushing through clouds and into a plane. This is the establishing shot. As we now know the film is going to start on a plane,0 it infers and prepare the audience as whatever is happening is likely to be daring as well as dangerous. However, Donner would have to do the different setup for different specifications received from customers. Therefore, the setup time of the process would increase in correlation with the increase in the number of orders. In other words, the more order they took, the slower they could produce. bomber , he is dressed in casual clothes which makes the audience believe that the bomber is a everyday normal person. The hero is dressed in African ambassador's uniform. The clothes for the other two Angels, Lucy Lui and Cameron Diaz, Lucy Lui is dressed in an all black catsuit because she is a detective. When the music stopped, everyone stepped back and all held a freeze frame, responding to a car crash. We then flashed back to in the bar, the opening scene of 'Too Much Punch for Judy', and showed the characters of Bob, Nob, Judy and Jo all having a good time, dancing. This really made the audience seem like we were the third-party, and had been looking back in time, through Stanislavski's 'fourth wall', peering-in on this real part of history. I think that this strengthened the actors' achievement in the play of portraying this realistic drama, and gave the audience time to reflect upon what they had just seen. Other moments? The final part Ian Redford plays is Captain Jemmy Campbell. He once again adopted a jacket on top of his clothes distinguishing between the two classes again. Captain Campbell is Ross? sidekick, a superior officer, who is strongly against the putting on of the convict?s play and always agrees with his views.